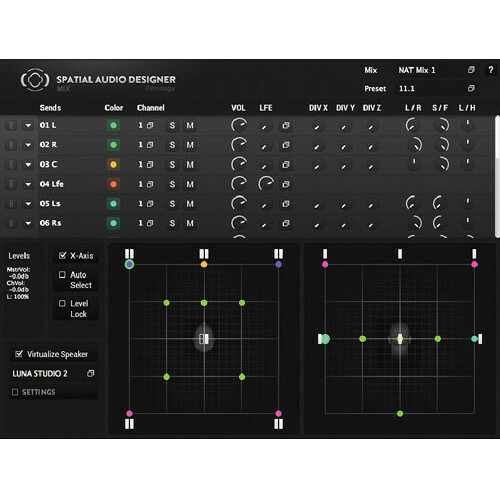 Spatial Audio Designer (SAD) Producer from New Audio Technology provides professionals working in 2D surround and 3D audio environments a tool covering both these aspects of audio content creation. Suitable for music, film, games, sound design and multimedia applications, the plug-in enables the mixing and monitoring of surround or 3D format with a flexible and personally adjustable Headphone Surround 3D speaker virtualization for use with standard headphones on any DAW. With eight discrete channel outputs the plug-in can import panning and volume automation data for converting an existing multi-channel 5.1 mix session in just minutes to a discrete 7.1 mix for cinema, home or mobile entertainment application. The Producer version allows for a total of two seats to be licensed and includes an In-One module for stereo monitoring with headphones.